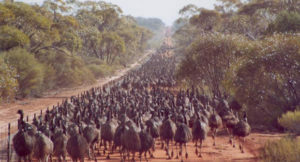 Sep 24 201549 Destroy All Emus! 1932 was a bad year for farmers in Australia. Hot weather withered grain, because of the Great Depression, promised agricultural subsidies were not forthcoming and, worst of all, there were emus. The large flightless bird devoured Australian grain, prompting the government to go after them with machine guns. It was called the Emu War, and the emus won. Veritable Hokum did a delightful comic about the Emu War. It features an emu in a hat. Emus probably did not wear hats. Attack on Emus from the Melbourne Argus, 1932.